In case that your institute does not support SURFconext and is not possible to get a DigiCert certificate, then you can apply for a DutchGrid CA certificate. 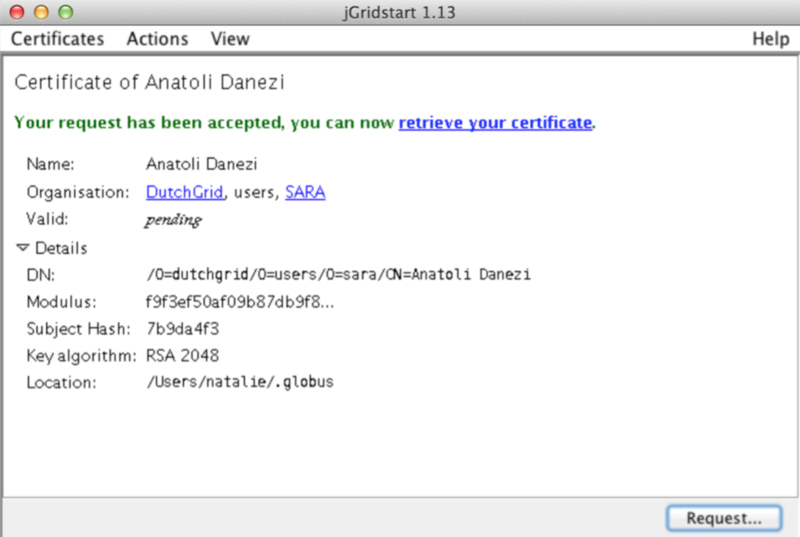 You can request a DutchGrid certificate by launching the JGridstart tool. $ssh -Y homer@ui.grid.sara.nl   # replace "homer" with your username! Generate request by entering your details (name, surname, email, organisation). At this stage you will provide the password for your Grid certificate - make sure you keep this safe! Submit request. This will create your private userkey.pem file in your ~/.globus directory. Fill in and print the verification form by pressing the display form button. Once you fill in the form, save it locally. Check your details in the printed form and contact your institution’s Registration Authority (RA) in person. The RA person will check your identity (id or passport or driving license) and sign the printed form. Once your form is signed by the RA, send a scanned copy to the DutchGrid CA via email or fax. The contact details can be found in the printed form, but you can contact also helpdesk@surfsara.nl if you are in doubt. The DutchGrid CA will finally send your certificate via email within ~a week. Once you have a received your certificate you will need to install it both on your UI account and your browser (UI or laptop). We’ll see this next. If you need help to obtain your DutchGrid certificate, please read the JGridstart guide or contact us at helpdesk@surfsara.nl. $ssh -Y homer@ui.grid.sara.nl # replace "homer" with your username! Click on retrieve your certificate. This will automatically create a file usercert.pem in your ~/.globus directory (check with $ ls ~/.globus). If everything went well, your certificate and key files (usercert.pem and userkey.pem) should be in the ~/.globus directory. If you followed the steps above properly, then your DutchGrid certificate and private key file should now be present in the ~/.globus directory (notice the dot!) on the User Interface machine. All you need to do is to set the proper permissions. $ssh homer@ui.grid.sara.nl   # replace "homer" with your username! Note that the private key file should be read-only and only readable to you. In order to apply for a VO membership you will have to install your certificate in your browser. Note that you can do this from any browser, however for convenience we will describe the procedure using the UI browser. You can import a certificate in your browser only when it is in the PKCS12 format. This means that you need to convert the usercert.pem and userkey.pem files to a single .p12 file. This will ask you for a password three times: the first is to unlock your private key stored in the file userkey.pem. The PKCS12-file will be password protected, which needs a new password, and the same password for confirmation. Note that your can use the same password as the password for the private key file, but this is not necessary. Give the password you set in the previous step. You should now see the certificate listed. Close the window. Need more details for installing your certificate on the UI or browser? Check out our mooc video User Interface machine.